Regaining the accreditation was something that the University’s Vice Chancellor had identified as a top priority. This publication understands that the accreditation body, the Jamaica-based Caribbean Accreditation Authority for Education, Medicine and other Health Professions [CAAM-HP], granted accreditation to UG because of the tireless efforts that were engaged to put recommended measures in place. The body, it was revealed, in making its reaccreditation decision had in fact given keen recognition to the outstanding leadership of the University’s Vice Chancellor in the quest to put certain measures in place. Also taken into consideration were the efforts of key officers, including the Director of the School of Medicine and the Dean of the Faculty of Health Sciences, in this regard. But it wasn’t only the “highly motivated and committed faculty” that contributed to the CAAM-HP decision but also the “enthusiastic, motivated and high quality students.” Added to this, CAAM-HP’s decision took into consideration the work undertaken by the curriculum team to develop a new 2017 curriculum which this publication understands is likely to be up for revision in 2021. CAAM-HP is the legally constituted body established in 2003 under the aegis of the Caribbean Community (CARICOM), empowered to determine and prescribe standards and to accredit programmes of medical, dental, veterinary and other health professions on behalf of the contracting parties in CARICOM. The acquisition of accreditation is therefore dependent on an institution’s adherence to certain stipulated standards. This translated to the School of Medicine working towards achieving some 140-plus standards established by CAAM-HP. The standards are divided into several areas including infrastructure, educational resources, faculty and the curriculum itself, and several others. In essence, the accreditation body, this publication was informed, was able to address a gamut of concerns raised by CAAM-HP in its report of 2013. Based on information out of CAAM-HP, accreditation for the UG medical programme was revoked because there were no progress reports forthcoming from the tertiary institution for the years 2014 and 2015. But the university was not in a position to submit these reports, since a number of measures had to first be put in place. Several of these related to infrastructure, educational resources, faculty and the curriculum itself, among others. One of the concerns of CAAM-HP that had led to the withdrawal of international accreditation in 2015 was the fact that there was no standing Memorandum of Understanding between the University, the GPHC and the Ministry of Public Health, making these clinical practice sessions formal. Moreover, among the measures that the University had to address, leading up to the CAAM-HP assessment process, were the introduction of plans for a new Health Sciences Faculty, improved clinical and lecture facilities and other amenities for medical students. The accreditation body had also focused on the university’s staff development programme to which the majority of staff had engaged over the last few years. It was observed by CAAM-HP that that programme had in fact produced a positive change and a move toward using more active learning methods which have been built into the new curriculum. There were also measures that were put in place by the Georgetown Public Hospital Corporation [GPHC,] which is tasked with aiding the clinical aspect of the UG medical programme. These were reportedly also commended by CAAM-HP which recognised that efforts in this regard has allowed for the availability of a wide range of the clinical material to the students, and that the early patient contact which makes the students learning more relevant. However, it is expected that other measures, including the upgrading of facilities and the addition of new infrastructure, will be among the factors that will help to ensure that the accreditation status is sustained. The accreditation path was paved following a CAAM-HP site visit in November of last year. During the site visit both the Turkeyen Campus and the GPHC were under scrutiny. The School of Medicine at The University of Guyana (UG) was recently “accorded Accreditation for four years from 2017-2021 by the Caribbean Authority for Education in Medicine and other Health Professions (CAAM-HP). The decision to grant re-accreditation with a few conditions to the UG School of Medicine was made at the July 2017 meeting of CAAM-HP. The School first gained accreditation in 2008 and functioned as a professionally accredited institution up to 2015. The re-accreditation of the School, located in the Faculty of Health Sciences, Turkeyen campus, follows a site visit to UG in November of 2016 by a team of evaluators from CAAM-HP, to conduct a comprehensive re-evaluation of the teaching/learning facilities available at the School and meet with the various administrative sections of the University and medical students. The team comprised Team Chair, Professor Christopher Stephens, Emeritus Professor of Medical Education, Faculty of Medicine, University of Southampton, UK; Team Secretary, Professor Jonas Innies Addae, former Head of Preclinical Sciences Dept. and former Deputy Dean, Faculty of Medical Sciences, The University of the West Indies, St Augustine Campus, Trinidad & Tobago; and Professor Trevor McCartney, Professor of Surgery and Deputy Dean, Faculty of Medical Sciences, The University of the West Indies, Mona Campus, Jamaica and former Medical Chief of Staff, University Hospital of the West Indies, Jamaica. The team was accompanied by Ms Lorna Parkins, Executive Director of CAAM-HP and Professor Emerita Marlene Hamilton, Chair of the CAAM-HP Council. In commenting on this long awaited announcement Vice-Chancellor Professor Ivelaw Lloyd Griffith congratulated the faculty, students and staff of the School of Medicine “on this signally important decision” and expressed appreciation to personnel and students of the School, the University Library, Registry, Estate Management, Information Technology, Personnel Division and other units, His Excellency President David Granger, the Ministry of Public Health, Ministry of Education , PAHO/WHO, and the Georgetown Public Hospital, for their contributions to this successful outcome. He stated that "This investment of time and resources by the university in the re-accreditation of the School of Medicine is a tribute to the entire university and it strengthens our brand overall as we pursue Project Renaissance." He further said, “however, substantial amounts of time and money will be required to complete the needed enhancements of one of our flagship programmes." This sentiment was echoed by the Director of the School Dr Ronald Aaron who emphasised that the accreditation was due to "community effort, now the real work begins". Shafali Milton, President of the University of Guyana Medical Students’ Association, expressed pride in the role played by the students in the eventual outcome. She said, “The road to regain our status as a regionally accredited medical school was filled with countless challenges, however, we, the student body were undaunted and did everything in our power to assist. We are elated at the result of hard work from both the administration and the student body and on this note; we would like to thank everyone who contributed in the process. The UGSM has regained its position as a prestigious institution in the Caribbean, one which the current students as well as its alumni can be proud to be associated with. We look forward to new endeavors as the journey continues". Dean of The Faculty of Health Sciences, Dr Emanuel Cummings, noted in his brief history of the School that it was established in 1985 in the Faculty of Health Sciences as a Medical Practitioners programme which included four years of medical training and two years of internship. This was upgraded in 1990 to a five-year programme followed by a one-year internship. To date, the School has graduated more than 500 doctors who are working in Europe, North America, Asia, Africa, Australia, the CARICOM Region and locally in leading positions in the Health Care Sector. Notable graduates include the current Junior Minister of Public Health, The Chief Medical Officer, Heads of Paediatrics, General Surgery, Orthopaedics, Cardiology, Emergency Medicine and Internal Medicine at the Georgetown Public Hospital Corporation (GPHC). With a current enrollment of some 8,000 students, The University of Guyana (UG) has graduated more than 20,000 students who have gone on to successful careers locally, regionally and internationally. The University is also a major contributor to the national economy and to business and industry. Established in 1963 on a part-time basis with shared space at Queens College, UG moved to its own campus at Turkeyen in 1970 and expanded in 2000 with the addition of the Tain Campus. It now offers more than 60 Under-graduate and Post-graduate Programmes including Engineering, Environmental Studies, Forestry, Urban Planning and Management, Tourism Studies, Education, Creative Arts, Economics, Law, Medicine, Optometry and Nursing. Several online programmes are available and The UG also offers extra-mural classes at four locations through its Institute of Distance and Continuing Education (IDCE). The UG also offers the opportunity for student engagement in debating, sports, and cultural, religious and professional activities. A Food and Nutrition Security Institute is on the cards for the University of Guyana [UG]. This is according to the institution’s Vice Chancellor, Professor Ivelaw Griffith. Griffith made this announcement at a formal installation ceremony held in the George Walcott Lecture Theatre last Friday. According to Professor Griffith, feasibility work for the establishment of an Institute of Food and Nutrition Security will begin in the New Year. Support for this venture has already been streamlined. “A distinguished Guyanese-born chemist will be spending her sabbatical year with us, and has agreed to lead this effort. 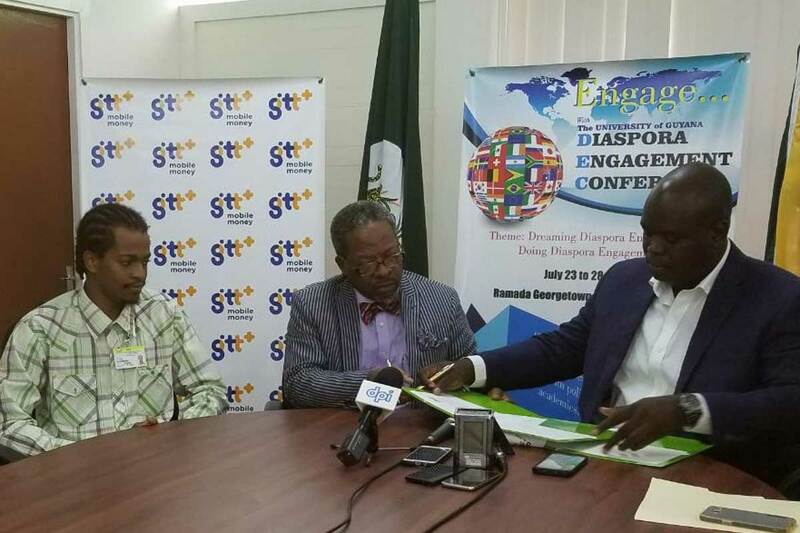 I have secured the collaboration commitment of the Director of UWI’s Centre for Food Security and Entrepreneurship at Cave Hill,” Professor Griffith disclosed. The Vice Chancellor spoke of moves towards re-energizing biodiversity teaching and research at the University. He noted that the collaboration with the Ministry of the Presidency and Iwokrama must be taken to a higher level. Professor Griffith saw these and other measures as important in the renaissance movement currently unfolding at the state university. Among the areas that the Vice Chancellor has also been giving keen attention to is that of the Law Department. In underscoring the need to address multiple challenges facing the Law Department, Professor Griffith outlined what he called two initial initiatives. The first initiative, according to him, will entail the commissioning of a comprehensive review of the department. 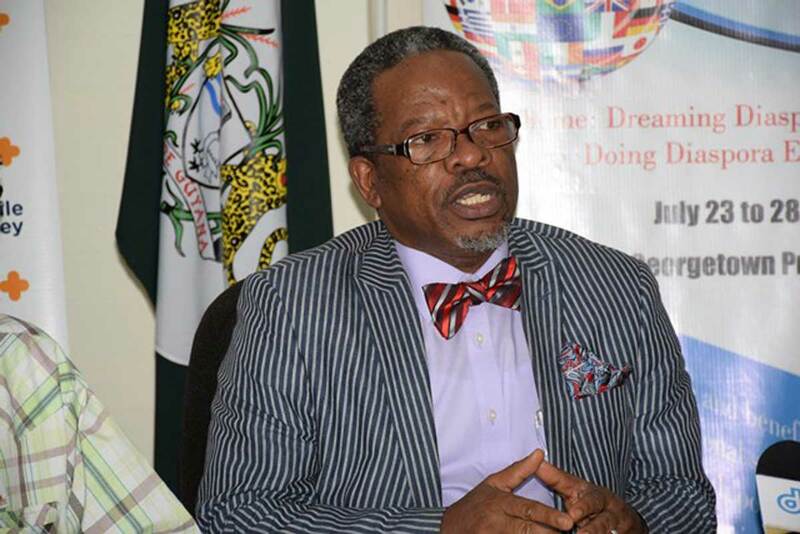 Professor Griffith who commenced his appointment as the UG Vice Chancellor in June last year has outlined a number of ambitious measures that he envisions will restore the image of the national university which, according to him, has been neglected for far too long. But according to the Vice Chancellor, while his reorganization plan of October 2016 catered for the establishment of a deanship for Research and Graduate Studies, a Centre for Teaching and Learning Excellence, and an Office of Legal Counsel, budgetary and other constraints precluded actualizing these. As such he noted that these will need to become priorities in the second year of the Renaissance. Part of his renaissance drive has seen the introduction of a series of actions including some that gave focus to the arts. These, according to him, have included, “using Renaissance House, my residence, as a gallery to showcase the painting and sculpture of our students and lecturers, hosting the inaugural Painting, Music and Poetry session at Renaissance House, and appointing the first Distinguished Artist-in-Residence, on a visiting basis, since Martin Carter held the position permanently decades ago. The University under the guidance of Professor Griffith has started working with the Indian High Commissioner to support what he called an important component of the programme. 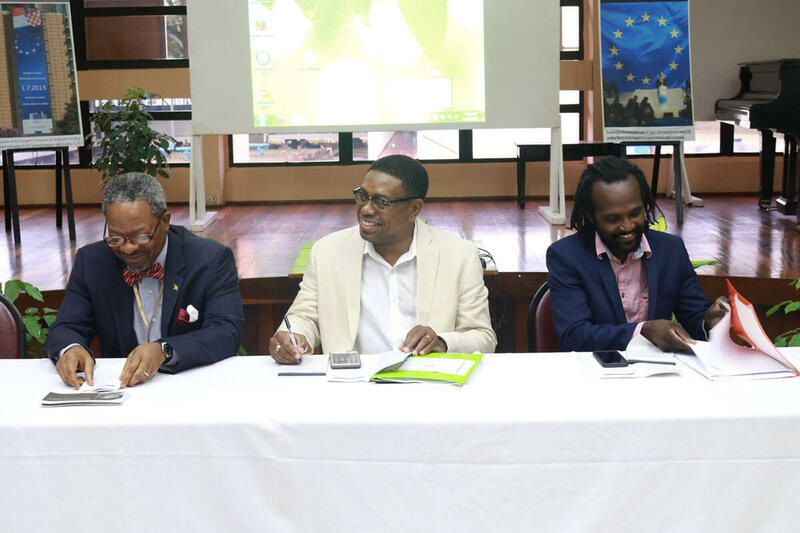 The University of Guyana (UG) and the Guyana Telephone and Telegraph Company (GTT), after launching Money Mobile Guyana (MMG) last month for students to make easy tuition payments, on Friday signed a Memorandum of Understanding to solidify the deal. Last month, the Ministry of Finance, GTT and UG launched a new payment plan that would be convenient for students to pay their tuition fees on their cellphones via the MMG application. On Friday, UG Vice-Chancellor Professor Ivelaw Griffith and GTT CEO Justin Nedd met to formally sign the MMG agreement that would benefit both international and local students at the university. Speaking at the event, Griffith noted that the new payment system would be beneficial to the some 8,000-plus students who attend the institution. It was confirmed that 60 percent of the student population on the university make cash payments annually, and this new payment system is aimed at helping them make the process easier. Griffith also mentioned how convenient the new system will be for international students who return to their homes after a semester break, as they will not need to travel back to pay their fees. The professor said that apart from the convenience for their students, it is also useful for the Bursary Department of the university. He noted that the MMG app, allows the Bursary to make a quicker turnaround to process student registration among other things, enhancing service delivery. “One of the central reasons that any university exists is to serve the main constituency which is the students and part of what we intend as the university to do is to enhance the nature, scope and significance of service to our students,” Griffith added. He also mentioned that what was captured in the agreement is that the partnership with GTT is to have other tangible elements to it, which will enable GTT to give to UG and its students additional benefits that will go to sports, medical services and other areas. Nedd said that apart from students paying tuition fees, they can also pay graduation fees, registration fees, summer registration fees, and any other additional fees that students are required to pay. Students are required to download the MMG app to start, enter their UG registration number, the amount they wish to pay and press send. A service fee of $100 would be attached to each transaction. Students can pay a minimum of $500 to a maximum of $60,000 in one go, however a student can pay $100,000 per day in their transactions to the university via the MMG app. UG has also boosted its ICT connectivity on all its campuses through an agreement that was recently signed between the University and the Ministry of Public Telecommunication. “They can expect full Wi-Fi on this campus wherever they go and that is a signally important achievement,” Professor Griffith added. Better dormitory facilities will also be available when the semester begins at the end of August. “There’s a list of new degree programmes baccalaureate(Bachelor’s) and post grad. 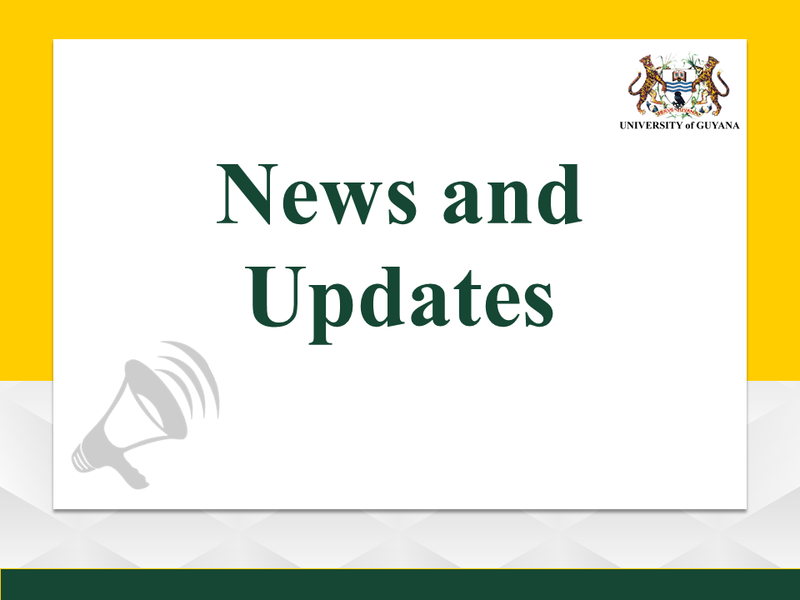 There is some new degree programmes coming on board as well in the next academic year,” Professor Griffith said. These improvements are all part of the University’s rebranding to modernise its campuses and curriculum. George Walcott Lecture Theatre, UG’s largest lecture theatre, fitted with air conditioning units. The collaboration between the Office of the Vice-Chancellor and the Centre for Communication Studies (CCS) of The University of Guyana brings to you this Volume 2: No. 3 edition of Renaissance, a monthly newsletter. Renaissance is the Vice-Chancellor’s medium of sharing with you our University’s developments. The month of March was filled with activities held in observance of International Women’s Day. Ms Audrey Benn, Lecturer in the Women Studies Unit has written an important message on the importance of celebrating women and our own Deputy Vice-Chancellor (Academic Engagement), Dr Michael Scott shared an impacting poem, both of which we hope you will reflect on. In this edition you will also read about a number of lecture series hosted by UG: Turkeyen and Tain Talks VI and the VC’s Renaissance Lecture Series II. UG recently launched its very own press as a publishing arm in collaboration with Ian Randle of Jamaica’s Ian Randle Publishers. This is truly an historic move by our University. The Renaissance team had an opportunity to profile the new Director of the Centre for Biodiversity, Dr Gyanpriya Maharaj. Additionally, in March the winners of the Turkeyen campus’ Open/Career Day were announced. We congratulate the Faculty of Earth and Environmental Sciences on winning the first place, Vice-Chancellor’s Cup in this event. Our alumni around the world have certainly made us proud. We feature in this edition of Renaissance the story of Ms Sonnel David-Longe’s 2017 Ridding Reading Prize from the Girton College of the University of Cambridge in the UK. As you read, be inspired to join us as we celebrate UG’s Renaissance!